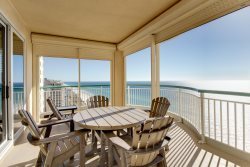 Our vacation rentals in Perdido Key, Florida offer a wide variety of amenities for an unforgettable getaway. With beautiful modern spaces for rent in private gated communities or cozy cottages on the waterfront, we are proud to offer amenities such as complimentary beach shuttles, tennis courts, private boat docks, Olympic-size swimming pools, hot tubs, and more. Our rentals are conveniently located near spectacular white sandy beaches and attractions like the Pensacola Lighthouse and Museum. For those looking to enjoy the outdoors, you will find plenty of opportunities for an adventure like kayaking and sailing. After a day of soaking in the sun or and evening exploring the nightlife - come home each night to a clean and comfortable rental with all the accommodations you need to relax. Perdido Realty Vacations has a wide range of vacation rental properties that each offer a unique experience for guests. We have great options for those looking for the luxurious resort experience, a beachfront condominium, a home on the canal, or a rental suited for family gatherings. With easy beach access, pools, hot tubs, tennis courts, golf courses and plenty of nearby attractions and events our guests enjoy memorable vacations in a beautiful setting. Surrounded by endless outdoor opportunities like kayaking, sailing, swimming, and much more - there is a little something for everyone at one of the best Florida beach resorts. Relax and unwind in a luxurious vacation rental with spectacular views and beautiful interior design. These premium rentals offer sun soaked balconies, spacious floor plans, and easy access to the beach, tennis courts, golf courses, and restaurants. Spend your vacation laying on white sand beaches, kayaking in quiet coves, or enjoy the culture of nearby coastal cities. Take advantage of biking and jogging trails, heated pools and large hot tubs, and fully equipped kitchens. These luxury rentals offer the perfect atmosphere for your next vacation. The Resort Villas at Lost Key are the newest addition to Lost Key Golf and Beach Club, Perdido Keys first master-planned resort community. Nestled between Lost Key Golf Course and the Gulf of Mexico, these unique 3 and 4 bedroom townhomes are perfect for golf getaways, holiday gatherings or family vacations. From the moment you enter Lost Keys gated community, youll feel the calm and beauty of nature. More than 300 acres of natural preserves, every effort has been made to maintain the existing topography and natural landscape. Enjoy the beautiful Audubon Signature 18-hole golf course, 5 miles of biking and jogging trails, restaurant and pro shop. Beach shuttle service is available for sun worshipers. Peaceful, protected, unbelievable! Also, enjoy the olympic-size swimming pool and workout facility at the Resort Villas and Private Beachfront club with restaurant. Sandy Keys beaches are forever protected by the neighboring National Seashore Preserve. If you prefer your walks on the beach, solely in the company of the seagulls, Blue Herons and seashells, then Sandy Key is the place for you. Sandy Key, a gated community, is located on 800 feet of Beach Front. Amenities for your enjoyment include 2 swimming pools (one geothermal heated), lighted tennis courts, fitness center with sauna, grilling areas, two elevators per building. Three buildings offer either two bedrooms, two bath units or three bedrooms, two bath units. Balconies are large and 200 Square Feet. Who knows, you may be lucky enough to spot dolphins frolicking or a Blue Angel fly by! Browse our condo vacation rentals to find a place thats perfect for your stay.